I love visiting, and watercolor painting in, Venice, Italy; it is so full of atmosphere and history. For an artist such as myself who enjoys tackling different textures, there is a painting around every corner. In fact every corner can become many paintings as the light and weather change! 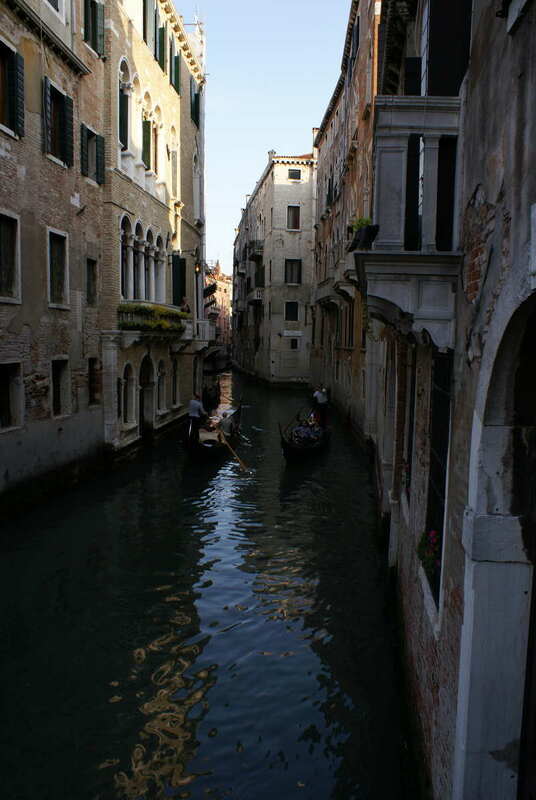 This narrow Venice canal was one such corner. In my recent travel to Venice I spent two weeks there which gave me plenty of time to soak in the feel of the place – though obviously not to the extent of the locals. However I still came away with a much better sense of the place than I had from my previous visit of only a day and a half. I stayed in a hotel called Hotel Malibran. The hotel was quite basic but it was only a few minutes’ walk from the Rialto Bridge and not much longer to San Marco (St Marks Plaza). This meant that I could walk to most places while at the same time easily catch the vaporetti (water buses) which provide a wonderful hop on hop off service around the main canals and islands of Venice. They also make some of the best locations from which to photograph this beautiful city. The vaporetti platforms often have a section which is fixed on supports (not floating) and these are especially good for taking photographs as they don’t move! I have an article on plein air watercolor painting on this site which shows some of the paintings I did while in Venice. I have painted many different scenes of Venice; from iconic landmarks such as Santa Maria Della Salute and St Marks Plaza to the timeless narrow back canals and streets that give you the feeling they have been the same for hundreds of years – which they have! Paper: Arches 300gsm Rough watercolor paper, approx. 7” x 22” (18cm x 56cm). Brushes: Round -Sizes 24 and 16 for larger washes and 12,10 and 8 for the smaller areas and detail. Paints: All Winsor and Newton artists quality – Cobalt Blue, French Ultramarine, Raw Umber, Burnt Sienna, Permanent Alizarin Crimson, Cobalt Turquoise and Cadmium Orange are the colors I used.